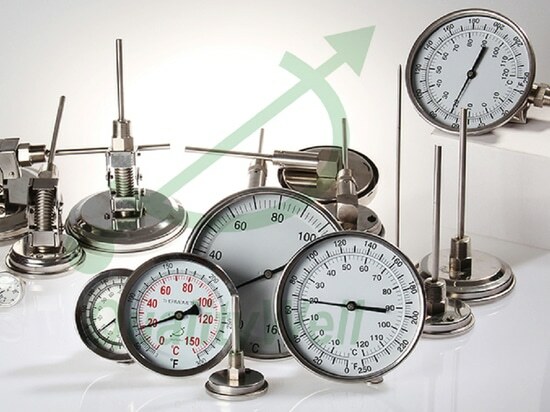 Bimetallic thermometer - 647 Taibo Rd, Jiading Qu, Shanghai Shi, China - Shanghai QualityWell industrial CO.,LTD. Two metals make up the bimetallic strip (hence the name). In this diagram, the green metal would be chosen to expand faster than the blue metal if the device were being used in an oven. In a refrigerator, you would use the opposite setup, so that as the temperature rises the blue metal expands faster than the green metal. This causes the strip to bend upward, making contact so that current can flow. By adjusting the size of the gap between the strip and the contact, you control the temperature. You will often find long bimetallic strips coiled into spirals. This is the typical layout of a backyard dial thermometer. By coiling a very long strip it becomes much more sensitive to small temperature changes. In a furnace thermostat, the same technique is used and a mercury switch is attached to the coil. The switch turns the furnace on and off.